Nakheel PJSC, the property developer at the heart of Dubai’s debt crisis in 2009, will have nine hotel projects under development by 2016 to benefit from the emirate’s growth as a regional tourist destination. 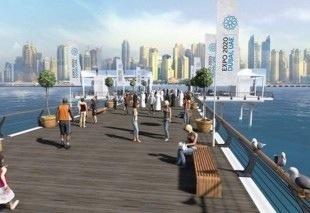 The builder of palm islands off the emirate’s coast may unveil plans to build four new hotels on Deira island along with its existing one, adding to four other developments across the rest of the city, Chairman Ali Rashed Lootah said at a news conference in Dubai today. The hotels will be part of new projects with a sales value of 6 billion dirhams ($1.63 billion) to 8 billion dirhams that Nakheel will unveil this year, including homes, retail and leisure destinations, he said. Dubai’s economy expanded 4.9 percent in the first half of 2013, led by the hotel and restaurant industry, as growth in the Middle East’s tourism and financial hub rebounded. Traffic through Dubai’s airport, the world’s second-busiest by international passengers, surged 15 percent to 60.4 million in the 11 months through November, official statistics show. Nakheel reported today a 27 percent increase in 2013 profit to 2.57 billion dirhams, helped by a 20 percent rise in revenue to 9.4 billion dirhams as Dubai’s property sector rebounded from one of the world’s worst crashes after the credit crisis. The company, which was rescued by a government bailout in 2009, said earlier this month it will pay 4 billion dirhams of bank debt due in September 2015 this year as it generated cash. Posted on January 19, 2014, in #middleast, #retail. Bookmark the permalink. Leave a comment.